Russia’s Grand Mufti has sent President Putin a letter pleading to defend the right of Muslim girls to wear the hijab in schools and universities. The cleric maintains that traditional headgear is a sign of modesty, not of religious zeal. Ravil Gainutdin explained in his letter that it was prompted by the fact that on February 11 Russia’s Supreme Court is scheduled to discuss the ban on Muslim headgear in schools introduced earlier in the Russian republic of Mordovia. The cleric also reminded the Russian leader that February 1 is marked around the world as “International Hijab Day”. “I address you as a mufti and as a father – please protect our traditional values, protect our daughters and granddaughters – the future of our great and beautiful Eurasian state,” Gainutdin wrote in the open letter published on Wednesday on the Russian Council of Muftis’ website. Gainutdin also claimed that a similar approach to women’s dress existed in other Abrahamic religions and traditional cultures. He added that the experience of predominantly Muslim regions, such as Tatarstan and Chechnya is proof that the policy of secular authorities’ non-involvement in religious issues can only have a positive effect. The mufti went on to blame foreign influence for the very existence of the hijab controversy. “Through the ‘headscarf issue’ certain foreign forces are imposing on us intolerance, anti-democracy and disrespect to Eurasian traditions of inter-ethnic friendship. They are politicizing a completely household, family issue. Through tearing off modest clothing they seek to tear the beautiful and complicated patterned cloth of the Russian world,” Gainutdin stated. No official response to the letter was immediately available. Towards the end of 2012, Vladimir Putin opposed hijabs in schools saying that though people’s religious feelings must be respected, Russia was a secular state. “We should see how our neighbors, European states deal with this issue [wearing hijabs]. And everything will become clear,” Putin said. However, the president stressed that decisions on the matter can only be made in an acceptable form – so that no one is hurt – and after a discussion with clerics. 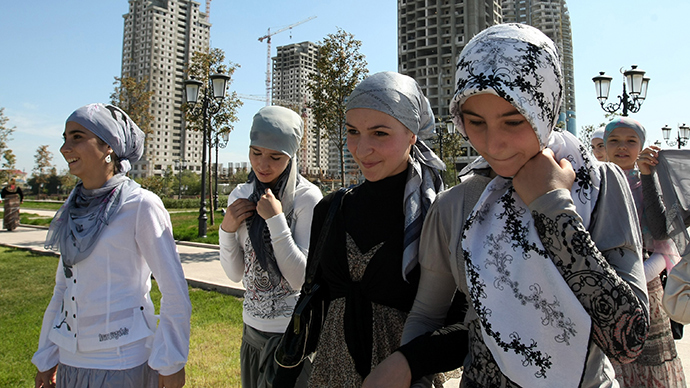 In July 2014, Russia’s Supreme Court banned the use of the hijab and other Muslim headwear in schools, following a complaint from southern Russia’s Stavropol region. Several months earlier, the regional administration ordered all schoolchildren to appear in classes only in regular, secular clothes. Local Muslims turned to the courts saying the regulation was infringing their freedom of faith as certain denominations of Islam requires that all women wear special headscarves called hijabs that cover their hair and necks. The regional court threw the claim out as, according to the judges, school regulations concerning dress did not prevent Muslims from believing in God and were therefore not infringing anyone’s rights. The Supreme Court also took the side of the Stavropol administration and rejected the appeal.